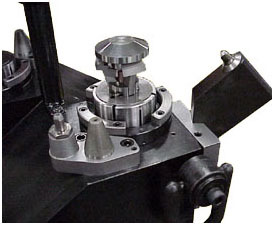 PROHOLD’s unique hydraulic expanding pullback clamping module can be used on parts with a minimum ID of 1.250″ up to any larger diameter necessary. The modules can be arranged on the tombstones in a vertical, horizontal or any angular orientation desired. The number of pods that can be installed on a tombstone is limited by the size of the machine’s machining envelope that can be used. The tombstones below were manufactured to fit a Mazak 400mm pallet machining center. This part is held down by its internal ID shoulder. The fingers on the pullback clamping mechanism in their retracted or unclamped position allow for the part to slip over the clamping fingers. As you can see in the photos immediately below, the fingers hug the pulldown shaft when retracted making for a small OD profile which is smaller than the ID of the part inside shoulder. When the pulldown clamp is actuated, you can see in the picture to the right immediately below that the fingers expand from their retracted position to an OD that is greater than the shoulder on the ID of the part. The bottom of each finger face engage the shoulder, and the top inside of the fingers is engaged by the swivel top cap of the pulldown shaft. The swivel cap allows for 1/32″ accommodation of any uneven surface on the shoulder surface for even distribution of the clamping force down on the part. The ID expansion collet also provides centricity and clamping of the part on the ID. These parts do not move once clamped into position, allowing for heavy metal removal rates. The pullback clamping fingers can be orientated in any radial position necessary for the particular part being processed. This part had three bosses that were not equally spaced about the diameter. The fingers were arranged to hit these bosses for a consistent clamping position on each part. 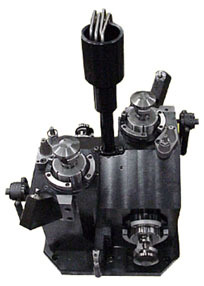 The combination of the ID expansion collet, pullback clamping fingers and radial locator makes a perfect setup that presents the part with exposure that allows for very aggressive machining and accuracies that are consistent from part to part, not to mention the ease of operator use involved to do the job. If you manufacture automobile or truck steering knuckles at your plant, you can maximize your number of parts per machine envelope using PROHOLD’s unique clamping module design. PROHOLD® fixturing will increase overall productivity of the manufacturing process and decrease the capital investment required to obtain these gains, by reducing the number of fixtures and machines necessary to get the job done. The loading and unloading of parts is much easier for the operator to manage. 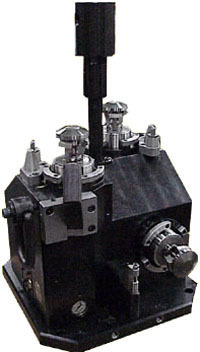 The fixture below was designed to accommodate four steering knuckles – two knuckles orientated on the side of the fixture for one geometric plane of machining operations, and two knuckles on the top of the fixture for the second geometric plane of machining. For every complete machining cycle of one pallet on the Makino A55 machine tool, two finished parts are produced off this fixture. 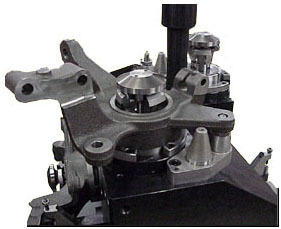 The parts locate on the bores which are first machined on a VTL. Take note of the fixture shape that was designed to eliminate chip buildup. The slanted profile of the fixture block allows chips to drop off the fixture. 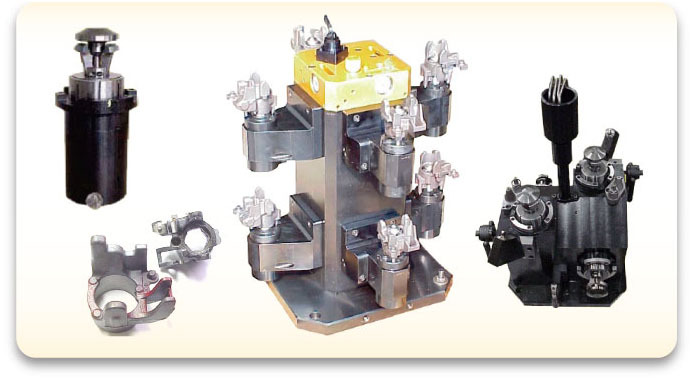 PROHOLD® designs use largely only internally drilled hydraulic porting. 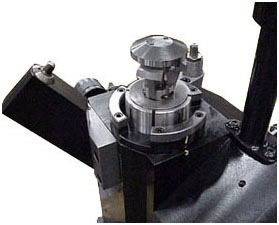 The hydraulics are fed to this fixture through a rotary union and vertical post located on the pallet center line. By this method, each pallet can be clamped and unclamped via. machine tool program M code. All four stations on the fixture are clamped simultaneously. For more information regarding our Hydraulic Pullback Modules please fill out the form below and a representative will contact you as soon as possible.